This weekend, the Barclays Center in Brooklyn, New York hosts two massive events. On Saturday, the NXT roster host the biggest event they’ve ever be a part of, and, on Sunday, the biggest WWE SummerSlam ever takes place. In this article, I’m going to break down every match and choose who I believe is going to win. For me, I can only see one outcome, and it is the champion retaining. Given Owens’ promotion up to the main roster, it is unlikely he will then claim back the title of the developmental brand. Also, Balor has just won the title, and I can’t see his reign being so short given his popularity and the hype they created when he first captured the title. Regardless, this match will be a classic, and both men will leave it all on the ring in front of an audience that will give both men a tremendous amount of respect. Winner = Finn Balor. This match isn’t as straightforward as the men’s title match. Banks has recently been promoted to the main roster, and Bayley is exceptionally over with the NXT crowd, so it seems like Bayley will win the title. However, Sasha Banks is being seriously protected on the main roster, and she is arguably the greatest diva in the company right now. A defeat in a match gaining so much attention could be harmful to her. That being said, Bayley is in the middle of a run which is similar to the run Sami Zayn went on when he won the NXT Championship, and I believe Bayley will be crowned just like Zayn was to a thunderous reception from the crowd. Winner = Bayley wins the championship. Two big men go head to head in a match both men need to win. The excitement of Samoa Joe’s debut hasn’t been pounced upon, and only a mediocre run since has ensued for the submission specialist. Corbin has been winning matches frequently, but only super-quick squash matches against nobodies. Both need a victory in this one to take a leap forward, and Joe will come out on top to keep him strong and propel him forward, probably to a title chasing run. Winner = Samoa Joe. When Blake and Murphy won the NXT titles, the crowd was shocked. A tag team with very little momentum, they pushed their way straight to the top, and, with the help of Alexa Bliss, have finally started to make that push worthwhile. The Vaudevillains are a credible opponent. Gotch and English have a truly entertaining gimmick and both are decent in ring workers. Alexa Bliss will play her part in this match, and I think she will inadvertently cost her men the titles and The Vaudevillains will walk away with the titles. Winners = The Vaudevillains win the championship. An eight man tag match that has been thrown together to showcase some of the workers who don’t get as much attention as the main stars but are more than capable of putting on a brilliant match. For me, the team of Ryder, Rawley, Amore and Cassady will win, and this is because of the popularity of Amore and Cassady. The crowd still eats up this team, and given their pairing with Ryder and Rawley who are just starting their revival, it can only mean good things for Amore’s team. Winners = Zack Ryder, Mojo Rawley, Enzo Amore and Colin Cassady. A fatal four way between four brilliant workers to give another reason why women’s wrestling is to be taken seriously. As brilliant as she is, I cannot see Becky Lynch winning this. She has her place in the revolution and she doesn’t need a win here. The same could be said about Charlotte, but she has more of a chance that Becky given the company’s confidence in her. She could win, but I think NXT will give the win to a roster regular, and, out of Emma and Dana, Dana needs it more to build up some credibility that she is yet to really gain. Emma is reviving her career in NXT, but she won’t come out on top in this one. I’m going with Dana, but don’t be shocked if Charlotte does win. Winner = Dana Brooke. In the third women’s match of the night, there is only one winner. Carmella is more about her association with Amore and Cassady than being a wrestler on her own at the moment, and Eva Marie has been getting a lot of attention since her training with Brian Kendrick. Only one winner here, but hopefully these ladies put on a good performance to create even more opportunity for the women. Winner = Eva Marie. Firstly, the Lucha Dragons have no reason to go over in this match. They have been booked poorly by the company, and they are in this match to add some excitement with some high flying moves. Secondly, Los Matadores are only ever booked as a joke. Their characters don’t seem like valid title contenders, and there’s no way they will leave with the gold either. That leaves two. The New Day are incredibly over right now. The crowd love them and the effort they’ve put into the gimmick. The stable also is made up of three good wrestlers. However, the Prime Time Players are unlikely to drop the titles so soon, and their popularity and media credit (Titus O’Neil being named Father of the Year) means that they will walk out with their titles. Only two teams could win this, but it will be the PTP who win. Winners = the Prime Time Players. Two fantastic workers compete in a match that could very well be the best of the night. 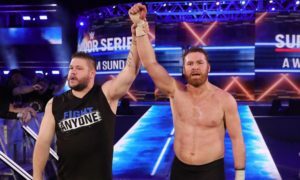 Kevin Owens and Cesaro have both recently showcased their ability in matches against John Cena, and they will have another opportunity against each other this time. Owens has been a remarkable heel, and Cesaro’s popularity ever grows, making this a difficult one to predict. However, I’m going for Owens, and that’s because I believe he will lose to Balor at the NXT event the night before. Owens losing two nights in a row with so much attention of both shows would really harm his credit, while Cesaro is still over in spite of all the defeats he has had, and he can recover from this. Winner = Kevin Owens. A match between two great athletes, sadly ruined by a dismal storyline. Rusev has been booked as a jealous, whiny boyfriend, just months after he was the unbeaten United States Champion entering a feud with John Cena. Ziggler is involved just to be the heartthrob that stole Rusev’s girlfriend. A poor story, but a decent match will take place, and Rusev will overcome Ziggler via submission. Expect Summer and Lana to be involved at some point as well. Winner = Rusev. Two established names meet again in a match that isn’t fresh nor intriguing. A stipulation or putting Sheamus’ Money In The Bank contract on the line would have added to the feud, but it remains a simple singles match. It will be a decent fight, but it won’t be remembered much after. Sheamus will win this one, as he finally gains some momentum in case WWE decide to have him cash in and win the world title. Winner = Sheamus. It seemed that this match was going to be just Amell vs Stardust, but Neville and Barrett have been thrown in to make it a tag team match. That’s not a bad thing, as Amell probably can’t wrestle a match all on his own, and Neville and Barrett are top workers. It’s unlikely that WWE will pull in a Hollywood actor to have him lose a match, so expect Amell to pin Stardust for the victory, but expect Neville to do most of the work. Winners = Stephen Amell and Neville. Summerslam doesn’t have a women’s title match because WWE wants Nikki Bella to break AJ Lee’s record for most amount of days holding the title, but they don’t want Nikki to beat Charlotte or Sasha right now to do so. As soon as Nikki breaks the record, Charlotte or Sasha will win the title almost immediately, so, right now, we had a tag match instead. Paige, Becky and Charlotte will win this one, as none of them are in a position to take a pin, while Alicia and Tamina are both in positions where they could take the pins for their respective teams. I say pins, but, with team PCB, it’s more likely to be a submission. Winners = Charlotte, Becky Lynch and Paige. Two thirds of the Wyatt Family face two thirds of the Shield. Throw in Erick Rowan and Seth Rollins and we have a repeat of Elimination Chamber of 2014. Still, this match will be fast and heavy hitting, and the crowd will love every moment. The Wyatts will win this one, just like they did in 2014, but only because either Ambrose or Reigns will turn on each other. This is the start of a feud between Reigns and Ambrose, and one will turn heel and attack the other to allow the Wyatts to win. Reigns is the most likely, as Ambrose is an extremely popular face right now. Where the Wyatts go after will be a mystery, but they will at least win at Summerslam. Winners = Bray Wyatt and Luke Harper. The first of two matches that are incredibly difficult to decide who wins. Given how successful his US Open challenges have been, it would be disappointing to see Cena lose his title. That being said, I also can’t see him winning the world title right now. He will beat Ric Flair’s record one day, but Summerslam isn’t the night he equals the record. I can’t see either walking out with both titles, although, if either of them do, it’s more likely to be Rollins who does it. I hope they don’t unify the titles and retire the US title though. That would be a bad move. There’s another option WWE could go, and it’s the one I think will happen. Sheamus cashes in, and wins. Whether that means he wins both titles of just the world title is questionable, but I believe Sheamus will walk out of Summerslam the champion, which will then set up a later feud between Rollins and Triple H. Winner = Sheamus cashes in and wins the WWE World Heavyweight Championship. This match is beyond unpredictable. Neither really should lose this, but only one needs the victory. Lesnar losing will weaken him and end his unbeaten run. Undertaker losing makes him look bad as he enters the final years of his wrestling career. It would also be strange to bring him back just for him to lose to the same opponent. But he doesn’t need to win. Lesnar, however, does. He hasn’t lose in a long time, but he also hasn’t won his last two matches. He didn’t beat Rollins at Battleground, and he didn’t beat Roman Reigns at Wrestlemania. He needs a clean win, but I don’t think he will get it. I think Kane will return, and he will cost the Undertaker, which will then set up a Wrestlemania match between them two in which Undertaker retires. It would leave the Undertaker and Brock Lesnar unanswered, but Brock really answered the question at Wrestlemania last year. Will WWE go with another screwy finish to end a PPV? Not usually, but for now, they will. Winner = Brock Lesnar, thanks to the help from Kane.